Kiana, Monika Mathews, Eva and Ashley McCarver outside their store in Columbia City. QueenCare in Seattle’s Columbia City neighborhood is much more than a beauty supply store. Opened in December 2018, QueenCare employs young women of color and provides them with mentorship, job training and support. On top of all of this, they sell amazing-smelling, all-natural skincare products at the same time. QueenCare founder and owner Monika Mathews has made it her life’s work to create opportunity and supportive community for young people. Monika created her nonprofit Life Enrichment Group 16 years ago and runs several programs out of the organization, including Young Queens, a personal development program that focuses on self-love, personal development, academic achievement and sisterhood for young ladies. “Entrepreneurship training is one of those tenants that we really focus on, and three years ago at Rainier Beach High School, we got an opportunity from the United Way of King County in the way of funding to be able to start an innovative program that focuses on economic development in Seattle,” Monika explains. “And so that’s where QueenCare really was born.” Girls involved in the Young Queens program at Rainier Beach High began making QueenCare’s line of products and selling them at festivals and community gatherings. Youth staff members Eva and Kiana show off QueenCare products. 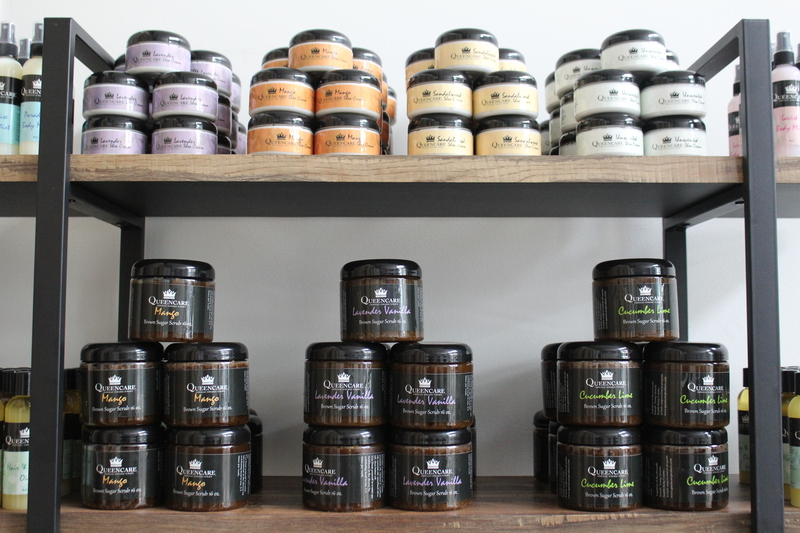 Customers can come in and try out QueenCare’s body lotions, scrubs, perfumes and more. You can find QueenCare at 3702 S. Hudson St., just off of Rainier Ave S. in Columbia City. You can also shop online and check them out on Facebook, Twitter and Instagram. If you’re interested in small business resources and support, check out our website or reach out to us anytime. The Seattle Office of Economic Development (OED) and Seattle Department of Transportation (SDOT) are excited to launch #ShoptheSqueeze: a campaign to encourage locals to visit small businesses Downtown during the Seattle Squeeze—the period of transition Seattle faces over the next five years as public and private construction projects continue to change how we get around Downtown. Driven primarily by weekly social media photo contests, the campaign encourages participants to visit their favorite Downtown small businesses via alternative transportation and share their stories. Alternative transportation includes walking, or traveling by bike, bus, ferry, Link light rail, Streetcar, or carpool – anything that helps ease traffic Downtown. Each month will feature a different small business sector, such as restaurants or art galleries, as a theme. Participants are entered to win prizes including $100 pre-loaded ORCA cards and Visa gift cards. Full contest details here. Shop the Squeeze will focus primarily on Belltown, Pioneer Square, the Chinatown-International District , and the downtown retail core as the neighborhoods most impacted by upcoming transportation changes. The campaign mascots, Simon the Sasquatch and Pearl the Squirrel, will deliver family-friendly campaign messaging about important transit milestones, ideas for creative commuting, and photo contest details via social media, transit advertising, and our website: seattle.gov/shopthesqueeze. While the new State Route 99 tunnel is now open, the Squeeze is long from over. Major changes to our transportation system are still on the horizon—our next big impact will hit on March 23, when the Downtown Seattle Transit Tunnel becomes Link light rail-only and hundreds of buses will move up to our surface streets. The Shop the Squeeze campaign is intended to keep people shopping and exploring Downtown neighborhoods in order to minimize the impacts of the remaining years of the #SeattleSqueeze on small businesses. #ShoptheSqueeze rolled out Friday, March 15th, 2019 and will continue at least for the remainder of 2019. To participate, follow @SeattleEconomy on Facebook, Instagram, and Twitter, and visit our website: seattle.gov/shopthesqueeze. Ada’s Technical Books, established at their current location in 2013, embraces Seattle’s nerdy population, old and new, and is dedicated to building community in the neighborhood in partnership with the 15th Ave Merchants Association. Owners Danielle and David Hulton combine bookstore, café, coworking space, tech paradise, and event space all into one. “When we moved in, it was super run down and it was still laid out as a house – which gave us a lot of freedom to do whatever we wanted to the space,” says Danielle Hulton. As proud, long-time Capitol Hill residents, the Hultons were passionate about keeping the exterior of the store looking the same as it has for years, choosing to build around and include existing elements of the house in the storefront. Before Ada’s, the space was Horizon Books, another bookstore and a longstanding staple of the 15th Ave community. To Danielle, Ada’s is a space for the newer tech community to gather, for café-goers to stumble upon, and for everyone to explore. “Someone might come in and be looking for a cup of coffee but then start playing with the puzzles on the shelf… and if that piques their interest, then that’s a win.” Danielle says. Ada’s is a meld of Danielle’s background in electrical engineering and various wide-spread interests. In the beginning, Ada’s was a staple spot for books about all things technical, from coding and programming manuals to children’s books to hands-on logic puzzles. The Hultons’ aim was to represent every aspect of the tech community. A good friend of Danielle’s used her food science background to get the in-house vegetarian and vegan restaurant menu off the ground in the cafe. As the years went on, the demand for a gathering space grew, and Ada’s listened. In 2016, The Lab at Ada’s became a rentable event space hosting public and private events, available for anything from work celebrations, anniversaries, and themed parties. Many pieces of furniture at Ada’s were made locally or especially for the space, and the Marie Curie-themed Lab even offers specialty cocktails concocted by the Ada’s staff. The Office, which opened in 2014, gives monthly desk renters 24/7 access to the space and a place to call home right on 15th Ave.
Moving to 15th Ave in 2013 was a jump of faith that Hulton says would not have been the same without the support of their neighbors and the 15th Ave Merchants Association. As a business district organization, the 15th Ave Merchants Association organizes community-wide events such as the 15th Ave Street Fest, where local businesses come together to celebrate and showcase their specialties. The association works together to build a stronger community by sharing expertise and supporting each other’s businesses. Whether it’s through her work with the Merchants Association or through the many facets of her own business, Danielle is finding all sorts of ways to bring people together. Her latest venture is Ada’s Discovery Cafe—stop by to explore the science behind coffee and try some delicious, experimental drinks. The Office of Economic Development Only in Seattle team is here to help support the neighborhood business districts who do so much to help one another. To learn more about our work, visit our website. Owners James and Subin Chang. There seems to be a Seattle-area food truck for just about every type of food you can think of. We owe our local, delicious, convenient, international variety of street food options to creative and resourceful small business owners like James Chang, owner of Seoul Bowl. Seoul Bowl’s menu takes Korean food staples and puts them in choose-your-own bowl form. Customers choose their protein option—bulgogi, spicy pork, chicken or fried tofu—and add toppings like kimchi and pickled radish. Their menu also includes mandoo (potstickers), bulgogi sandwiches, and bulgogi kimchi fries. With Seoul Bowl, James is bringing his favorite flavors from Korea to Seattle. “After graduating college, I lived in Korea for about five years traveling and eating all kinds of foods,” he says. “A lot of times I was always asking myself why there wasn’t this kind of food in Seattle. When I moved back to Seattle with my wife, we decided to start a food truck in hopes to share more flavors and foods from what we had in Korea.” James and his wife, Subin, came up with their menu together, based on their favorite meats and sauces from Korea. While James enjoys the freedom of running his business out of his truck, any food truck operator will tell you it’s not easy. James worked with the Office of Economic Development’s Restaurant Advocate, Jennifer Tam, to navigate requirements and get his business up and running. “She has helped me basically from the start of my business until now,” he says. Seattle foodies can look forward to future brick-and-mortar Seoul Bowl locations—for now, the truck can be found year-round at various locations and events around Seattle, Bellevue and more. “We are currently in the process of getting some permanent spots in the Seattle area, which we’ll be at for lunch,” James adds. Food truck locations are competitive and can be difficult to obtain. James’ success in getting locations that work for his business is just one aspect of the hard work mobile food vendors put into creating a successful business. Organizations like the Washington State Food Truck Association, Seattlefoodtruck.com, and the Seattle Department of Transportation are just a few of the ways mobile food vendors hustle to obtain locations on private property and in the public right-of-way. Got an idea for your own food truck? You can find resources for opening a food business on our Restaurant Success page, and get in touch with us to learn more about our services for small businesses. Armoire is a Seattle-based startup that wants to change the way people—for the moment, mostly women—approach their wardrobes. Armoire members complete a style profile including questions about size and style preferences. The app then presents a “closet” of items for the member to choose from based on an algorithm and assistance from professional stylists. The chosen items are then shipped to the member’s home. Members wear the pieces for as long as they want, and swap items when they’re ready for something new. On the business end, Armoire is a team of a little over 22 people—also mostly women—operating out of The Riveter coworking space in Capitol Hill. Armoire’s Founder, Owner and Chief BossLady Ambika Singh sat down with us to talk about her experience building a brand that caters to all women. Tell us about your background and career leading up to Armoire. I’m from Seattle, I grew up on the Eastside. I went to college in New Hampshire, pretty much as far away from Seattle as you can get. I really missed it here, so I came back as an intern at Microsoft, twice, which was really different from what I was studying. At the time I was a history major with a concentration in Asian studies. I wrote my thesis about microfinance in India, so landing at Microsoft was not a straight line. My first startup experience was less than the big success it was expected to be. We went from about 17 people a year in, and then the company laid off 14 of the 17, in my perception, overnight. It was really blindsiding for me. Ambika and one of her co-founders, Brittany Seabaugh. Looking back, it was professionally the most devastating thing that had happened to me. The first day was bad, the second day was better, and by three weeks later, I started to pick myself up and walk away. I learned even in the worst case, the worst case is okay. I realized this would not break me, and there would be another thing. With the first half of 2018 in the rear-view mirror, we’d like to look back at some highlights of the last few months as we look forward to supporting you in your business and in your career. Our teams have been hard at work for you in the community; we are pleased to report that as of mid-June, the combined efforts of our Small Business and Key Sector teams have directly provided services to 503 businesses. Our “Only in Seattle” team, through community partners, served an additional 374 businesses. In addition to individual contacts, read on for just a few examples of community convenings in which our office is engaged. Africatown Innovation District Lunch and Learn: In June, we were delighted to host Africatown in the Bertha Knight Landes Room of City Hall, where over 30 community and corporate leaders met to explore available resources and programs in support of a robust innovation district in the Central District. With a shared goal of preparing underrepresented youth for meaningful careers in IT and the creative economy, participants mapped current efforts, reflected on what is and isn’t working, and articulated their commitment to a more equitable tech economy. We thank GeekWire, Microsoft, HTC, HEREseattle, Seattle Colleges, Vulcan, Social Venture Partners and our City colleagues in Arts, IT, and Planning and Development for their time and energy. We look forward to next steps! Peer Networking Event on Commercial Affordability: In our work with the Mayor’s Small Business Advisory Council, market and systemic pressures continue to make commercial affordability a significant challenge facing small businesses. In May, we convened about 15 business district managers from across Seattle at a local startup firm – Blokable – to discuss commercial affordability. The Office of Economic Development’s (OED) Only in Seattle, Small Business Development and Key Sectors teams, in partnership with the Seattle Chinatown International District Preservation and Development Authority (SCIDPDA) and Onpoint Real Estate Services, organized this peer networking event to share a model for commercial lease education workshops in Chinatown ID and Little Saigon, vet innovative solutions for affordable commercial space, and make connections between business districts. Summer Youth Employment Experiences: As a part of our office’s efforts to provide a continuum of career-connected learning and work experiences for Seattle’s youth, every summer, employers across the public, private and non-profit sectors in Seattle open their doors to thousands of youth interns. We thank the private sector donors who have together contributed over $150,000 to support youth employment this year, and in particular, our valued partner JPMorgan Chase, who through five years of cumulative support, surpassed the $1 million mark in 2018! Given our focus on equitable access and prioritization of under-served communities, including young women and people of color, we are thrilled to spotlight Zilllow Group’s “Shadow an Intern” event at their downtown headquarters. To better enable high school students to envision their careers and set themselves up for success, youth from TAF Academy, YWCA, and the Seattle Housing Authority enjoyed personalized tours of the Zillow office, and a panel focused on career development tips. Until the fall, stay tuned to the Bottom Line Blog for updates, but in the meantime, please feel free to contact me if our office may better support you in your business and career! Sphere Solar Energy owner Edwin Ngugi Wanji stands in front of the solar panel system his company installed for Hellbent Brewing Company. Growing up in Kenya, Edwin Ngugi Wanji says he was the kind of kid who was always “trying to figure out how stuff works.” “A solar panel on my mom’s little calculator was always very fascinating to me, and I pulled a lot of those out as a kid,” he remembers. Edwin is now the owner and founder of Sphere Solar Energy, a small business that installs solar energy systems for clients across the region, and for communities around the world. After a childhood spent dissecting calculators, cameras and radios, Edwin arrived in the United States and got a job working on a construction site, where he began working his way up in the field and picking up expertise along the way. He started working in solar energy about eight years ago, and left his job to start his own company three years ago. “The fact that we can fully solar power homes in Seattle, 100 percent, in the cloudy weather, was just a big, ‘Whoa! We can do this anywhere,’” Edwin says of his decision to go into the industry. Edwin shows OED staff the meter that monitors Hellbent Brewing’s solar energy system. On sunny summer days, the system generates excess power which gets fed into the surrounding power grid (and earns extra money for the business). Edwin has big plans for his business: he hopes to work with more commercial-scale clients, such as the project Sphere Solar Energy recently completed at Hellbent Brewing Company in Lake City. With 72 solar panels on its roof, Hellbent is now home to the largest solar system on a brewery in Washington State and generates 30 percent of its energy. Edwin is particularly interested in working on projects with local schools so that he can involve the students in the projects—having early experience with solar energy means the kids will be more likely to apply the technology in their future. Edwin didn’t make a profit on Sphere Solar Energy’s early projects, at first just trying to get his name out there and prove the quality of his work to attract more customers. As one of very few immigrant-owned solar energy companies, Edwin built his business without easy access to loans. “For instance, if I need to buy equipment or anything, I need to pay cash. I put money away and go buy it,” he says, explaining how he’s had to pay his business’s costs out of pocket due to a lack of financing. At the same time, Edwin appreciates that he is in a unique position to help others pursue a similar path. While working on the Hellbent Brewery system, Edwin and Hellbent owner Jack Guinn invited low-income teens from the Lake City neighborhood to job shadow for a day. Edwin hopes that by seeing someone they can relate to—someone who arrived in the U.S. with $40 in his wallet—being successful in the field, kids will be able to see themselves working in the industry someday too. Sphere Solar Energy is getting involved in its community in other ways too. The business is providing a solar system (plus maintenance and support) for a BLOCK Project home in the Greenwood neighborhood. The BLOCK Project aims to provide tiny homes for people experiencing homelessness in residential neighborhoods across the city, and are designed to be completely off-grid. BLOCK Project co-founder Rex Hohlbein says Edwin jumped at the chance to offer his solar energy services when he heard about the project. Edwin’s humanitarian efforts go far beyond just Seattle. He is passionate about growing his company’s philanthropic efforts, since even small systems can make a huge difference to communities around the world that don’t have existing infrastructure. “A system that I can put on a house here [in Seattle], over there, three or four hundred kids would benefit from it,” he explains, describing a planned project for a school in Haiti. You can learn more about Sphere Solar Energy—and how you may be able to put your monthly energy bill towards other things—on their website, or by connecting with them on Facebook. “And so I did” is a refrain of Mary’s as she discusses her 37 years of running Flowers Just 4 U in the Central District. She worked as a manager at Boeing in the early 80’s and at the same time wanted to go to school to learn new skills, like photography, so she did. She decided she wanted to open her own flower shop, so she went back to school again. “I took small business, flower design. Because I’ve always been creative, but I wanted to be a professional at it. I wanted to prepare myself, to be good at it. So I did. So here I am,” she gestures from behind her shop counter. While some things have changed at Flowers Just 4 U over its nearly four decades in business—the location, for one thing, as the shop recently moved to a new home at 701 23rd Avenue—the business still feels refreshingly old school in the middle of a rapidly-growing Seattle. Mary can name customers that have been buying flowers from her for over 20 years, including the Tabernacle Missionary Baptist Church, Seattle Unity Church and a customer Mary identifies as “Mrs. Flowers” who has been visiting the shop since it opened. The business has just three employees in addition to Mary, plus two delivery drivers. While they’re a small operation, they provide flowers for big events like graduation ceremonies and same-day delivery services. Mary says a good portion of her business comes from the three wire services she belongs to. Asked for advice for aspiring small business owners, Mary says to have patience and to prepare yourself for the challenge: “You have to have the knowledge of how to run a business.” If you’re wondering where to get that knowledge of how to run a business: the Office of Economic Development can help connect entrepreneurs with business education, free consulting and more. Become one of Flowers Just 4 U’s new regulars by visiting their website, or give them a call at (206) 324-1440. You can get connected with OED’s services for small businesses by emailing us at oed@seattle.gov.